Beyond all popular belief, aging is a part of life and unavoidable. If you don’t have a strong belief in that idea, or if you’re in extreme denial, as the 77 million baby boomers in the US that were born between 1946 and 1964 according to fool.com.1 Sure, you wouldn’t know it when looking at people like Christie Brinkley or Prince, may he rest in peace. However you can believe science when it says, yeah you’re getting old and there’s not a whole lot you can do about it but embrace it and keep your mind and body healthy. The symptoms and side effects of getting old is overly apparent and a constant reminder that you can’t defy nature. If you’re an athlete, you may notice your healing time gets longer and longer the more you play and the older you get. Age has you slowing down a few steps. Maybe you’ve always taken pride in your ability to see anything and notice details from long distances. As you get older, this spectacular vision may be downgraded to decent site. You may find yourself using reading glasses more often. Something as simple as getting up in the morning could begin to pose challenges. Maybe year of partying caught up and your body requires more rest to recoup the years and feel normal. Maybe the impacts you’ve encountered in your life takes a toll on your bones and muscles, creating chronic phantom pains all over your body. Pain medication may be a normal part of your life, more so than it ever was. Whether you’re a man or a woman, you can count on and look forward to different types of symptoms from aging. You can curb these symptoms, but there’s no getting rid of them permanently. You will get wrinkles, even if you use anti-aging cream. Some of your skin will start to sag, even if you work out regularly. And probably one of the most annoying symptoms of aging is hair loss. For many of us, our hair is a bit of a lifeline to our youth. Once the hair starts going, at least for men, there’s not much you can do but look old. You can go the toupee route, but unlike women, it is highly noticeable and some people even get made fun of. Toupee’s can be a bit taboo. Hair loss is prevalent amongst the older community. 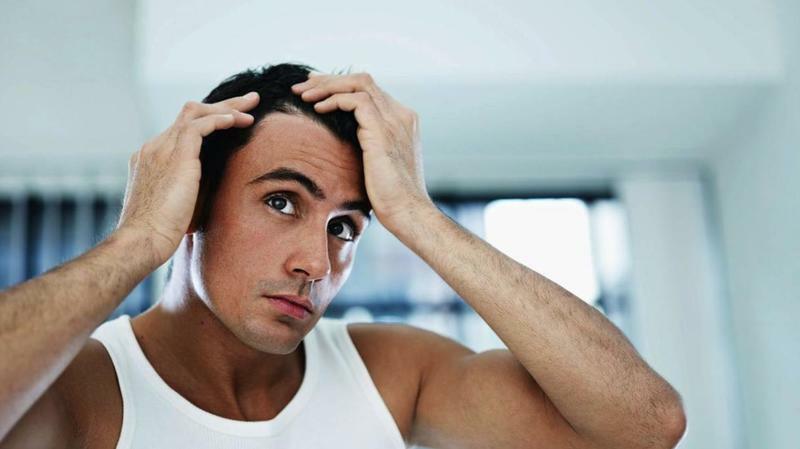 According to thehairsociety.org2, approximately 35 million men and 21 million women suffer from hair loss. According to the same study3, 40% of men start losing hair at the age of 35 and that number jumps to 70% for men going into their 80s. Around 80% of women will see hair loss by the age of 60. It begs the question, what can we do about all this aging? There are services and treatments specifically focused towards our aging community here in the US. Hair loss for many people, is a symptom that is very hard to deal with. Some don’t mind the wrinkles and other symptoms that may be unavoidable, but they draw their line at the hair loss. Many don’t want to be wrinkly in the face and bald at the same time. For some that is just too much to bare. Aging should be a gradual process, you should be 35 and wake up a day later looking 50. This does happen to some. Fortunately, there are treatments for seniors who are not ready to lose their beautiful hair. According to Folexin.com4, Folexin is made with all natural ingredients that help to support the natural process of hair growth and improve the visible strength and quality of your hairs texture. The key benefit for this product is that it is completely natural and therefore safe for seniors to use. Many times, products, such as Rogaine, are suggested for hair loss treatments, but it has not been proven that the product is safe for seniors. As we age, many of us are more conscientious about what we introduce to our bodies. All natural products are appealing because there are little to no side effects associated with using the product. Consumers can get a 30-day supply for about $25. You may get a discount if you buy in bulk. Keeps works with licensed pharmacists and doctors to help find the right treatment for hair loss cases. They will also follow-up while you are in treatment, which adds a personal touch to this hair loss treatment. Orders start at about $20 for a 3 month supply, which comes out to a little less than 7 bucks a month! Depending on the severity of the hair loss, you may be prescribed stronger products that could cost a bit more. Propecia could run you about $50 for a 3 month supply, but has been known to be quite affective. Keeps uses products that are safe for seniors to use. Shapiro MD was developed by multiple physicians over a decade. An abundance of research and development was done to come up with all natural products to combat hair loss. You can also use their shampoos and conditioners that are specifically designed to combat the main causes of hair loss. You can get a one-month supply of Shapiro MD products for $70. It’s a little more expensive than other products, but you’ll see the difference in your hair. You even get a 60-day money-back guarantee so there’s no risk to try before you buy. Profolilica is a great product to address male pattern baldness. Unfortunately, it is not a product for women. Profollica is an all-natural product so it is a great alternative to people who are leery of exposing themselves to harsh chemicals. It is a simple daily topical solution and meant to curb hormones that contribute to hair loss. You can get a one-month supply for $60. Like other products, ordering in bulk will save you some money. You’ll also be able to try the product risk free with their money back guarantee. Try out any one of these amazing products if you are a senior who suffers from hair loss. You’ll be happy you did. Jessica begins each day with a joke that she shares with the team in order to build spirits up. Most agree that if it weren’t for Rebecca and her comical demeanor, the office just wouldn’t be the same. She brings that talent into her work by creating stories that bring laughter to people’s day.